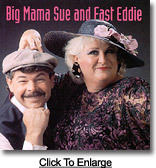 Wherever Big Mama Sue appears, people are always asking: "Can I bring her home with me?" Now, for a few meager dollars, you can. How? By purchasing one of her CDs or cassettes! Purchasing CDs and cassettes is easy with our online ordering feature. Payments are processed through PayPal so you know your transactions are safe and secure. Just click the "Add To Cart" button next to the items of your choice, then click "View Cart" when you're ready to check out. You'll be taken to the PayPal payment page to finish your transaction. Shipping and handling is $2 per item; 7.25% sales tax will be added for California residents. International orders will incur additional shipping cost; contact us for more information. The MP3 audio samples on this page are mono and have been greatly compressed to facilitate fast transfer over the Internet, thereby reducing the quality of the audio (the samples on this page are approximately 100k to 200k in size). 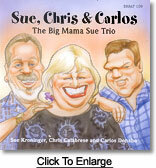 All CDs and cassettes available for purchase from Big Mama Sue Productions are of the highest-quality stereo audio. 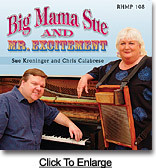 For high-quality samples of Big Mama Sue's music, including free (WOW!) 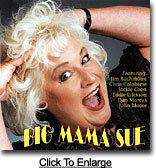 full-length downloadable MP3 songs from Sue's CDs and cassettes, be sure to visit the Hear Big Mama Sue page. If you would prefer to pay by mailing a check or money order, we can do that too. Contact Big Mama Sue Productions by phone or e-mail and we'll give you instructions on how to order.